Grand Street Settlement House, we piloted a workshop session with seniors because they have a lot of senior programming. Before they met with the seniors, the students went through different questions, such as ‘To feed your process, what would you want to ask someone who has lived in the neighborhood for a while? What might they know that you wouldn’t know? How do you think they would use a park differently than you?’” A set of interview questions were drafted and then two different seniors, both immigrants from Puerto Rico, were interviewed by the students. At the end of the young designers program, they hold a showcase of all the student work and have a ceremony for the students, their parents, and the community at large. Other student groups come through the space, take a tour, and do a more abbreviated workshop, building off what they see from the other students’ groups. 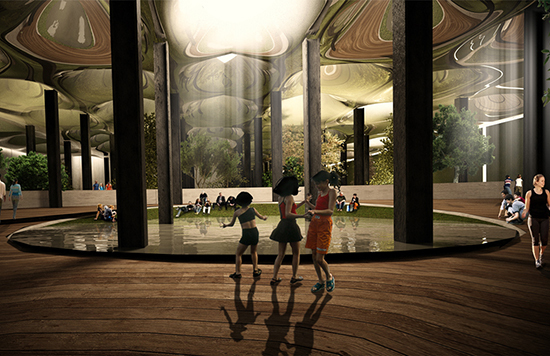 Images courtesy of: Lowline Project. Originally posted to ConnectedLearning.tv on June 8, 2015.